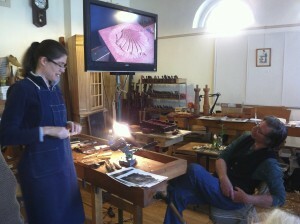 I drove up to North Carolina this last weekend to take a class at The Woodwright’s School. Master Woodcarver Mary May was there to teach and I can recommend the whole experience to you. Pittsboro is a small town in a rural part of North Carolina about six hours by car from Atlanta. I drove up on Friday for a weekend class and when I found the town about 7:30 pm, it was rocking. All the eating places were open and there was not a parking space to be had on the main street. It turns out Chapel Hill is about 20 miles east and the little town is really popular with the college students. You could call it a bit of an artist’s colony, I suppose, since for example, there is an old house just down the street with all kinds of brightly painted metal objects and sculptures all over the yard and the porch. The roads in and out of town are filled with pottery shops. All the old service stations are now restaurants, and there are all kinds of shops up and down the main street. The Courthouse is in the middle of a roundabout in the center of the main street and it is a lovely little town. The Woodwright’s School, owned and operated by Roy Underhill, is right on main street in an old dry goods storefront. It is just perfect. If you have been a fan of The Woodwright’s Shop on public television for the last thirty years as I have, then you will feel like you walked onto the TV set. Many of the antique and foot-powered tools and many projects from the show are sitting in the front windows. My bench had probably thirty jointer planes on the shelf underneath. Roy has a lot of tools. Our instructor, Mary May, is a Master Woodcarver from Charleston, South Carolina. She has done the traditional apprenticeship thing and she is a classical woodcarver. Mary focuses mainly on carving antique furniture reproductions and architectural decorations. We asked if there was anything she did not choose to carve and the only thing she could think of was the potential client who wanted his children’s faces carved in a huge chocolate bar. Mary offers online classes and videos and teaches at various schools around the country, including I believe she said, a class at the High later this year. You can go to her website to see more. Early on Saturday morning, nine suspects showed up with our sundry carving tools. The first thing we did was hike the benches (all the benches from the High, by the way) up to a height suitable for carving — you know, the old bench top at the elbow trick. That turned out to be a good move since you can see the work and you can get your arms and shoulders into the job. Instruction started with a couple of hours on sharpening and I am proud (I guess) to say I was able to furnish a perfect example of a completely dull and misshapen vee gouge for Mary and Roy to use as a demonstration. In fact, Roy took the vee gouge and spent the next hour reshaping and sharpening it to make it really useful. I told him I would never be able to use it again — I was going to frame it. Our first task for the instruction was to carve a doughnut in relief in a block of basswood. Mary does this to demonstrate the importance and to gain experience in the difficulty of getting the tools to go through the grain smoothly. Try it and you will soon see the problems, since the grain changes eight times if you are lucky and have a smooth grained block of wood. Lunch was at the old drugstore next door and it was excellent. We all went over and ate together and then after lunch we had a little time for the used tool store upstairs. After lunch, we started on our next project and spent almost a full day on a low relief camellia blossom which Mary first created from real life. But that is a topic for my next post. “I drove up”… who is “I”? ” is a topic for my next post.”… who is “MY”? Looks like someone had a lot of FUN FUN FUN!